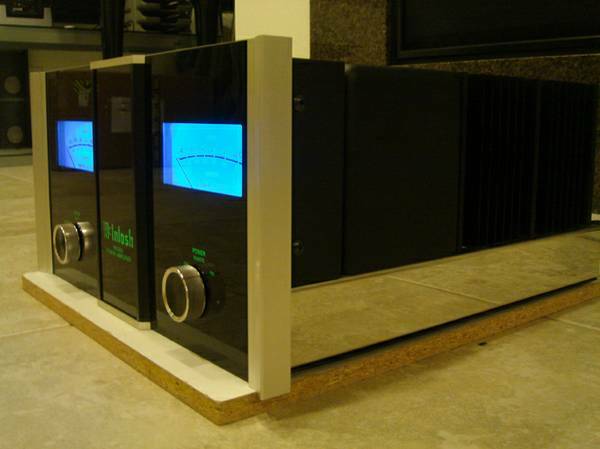 Recycled Stereo Plus: The McIntosh MC402: absolute transparency and musical accuracy. 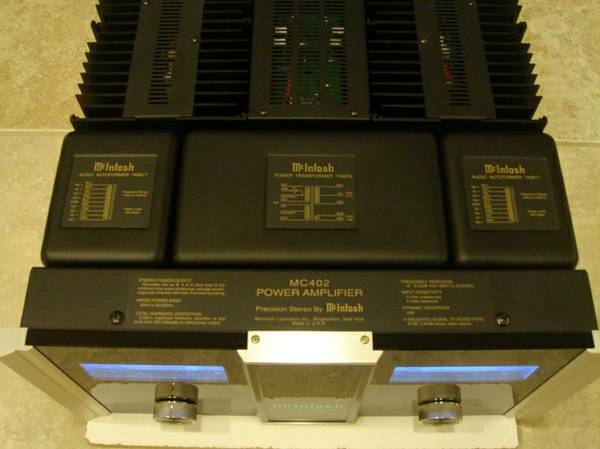 The McIntosh MC402: absolute transparency and musical accuracy. If you are looking for a high power amplifier that combines the power and lush sound of many of the finest amps available at any price, look no further. Continuing the McIntosh tradition of innovation and exceptional performance, The McIntosh MC402 delivers absolute transparency and musical accuracy. Winner of "The Absolute Sound Editor's Choice Award" 2005. "New quad-differential design cancels virtually all distortion and consists of four complete amplifier circuits, each a mirror image of the other, whose outputs are combined in the unique McIntosh made autoformers, delivering absolute transparency and musical accuracy into loads of 2, 4, or 8 ohms. A new three dimensional glass faceplate design adds elegance while the illuminated peak-responding meters show the true output regardless of load. " This amp has a very natural sound. Very round and full, with effortless crescendos. The bass is deep and powerful - you can feel it. Sonically accurate and natural is what impresses me the most. The best part is the imaging. Wherever the soloist is, you can close your eyes and hear exactly where they are! This amp images better than anything else I have ever heard. Truly excellent sound stage. The MacIntosh MC402 has multiple protection circuits, including the exclusive McIntosh Power Assurance System, thermal sensors, and turn-on delay circuits. Most other amps are overheating themselves to an early retirement. This amp runs extremely cool. 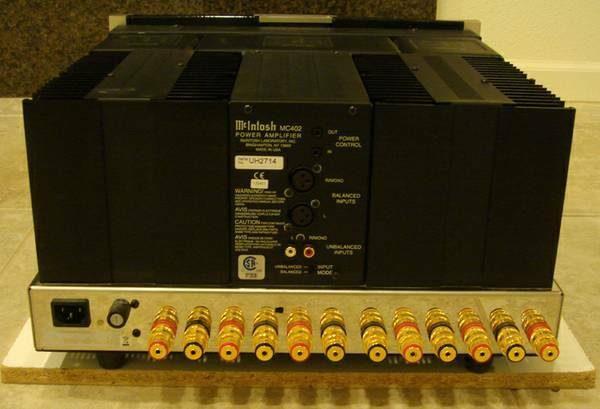 If you want an amplifier that will last a long time, this will do the job for decades to come. The build quality is state of the art. Inspecting the inside, it resembles military and NASA grade equipment. It's not hard to imagine that this amplifier will outlive me. The MC402 delivers 400 Watts per channel in stereo or 800 Watts in mono into 2, 4, or 8-Ohm loads. 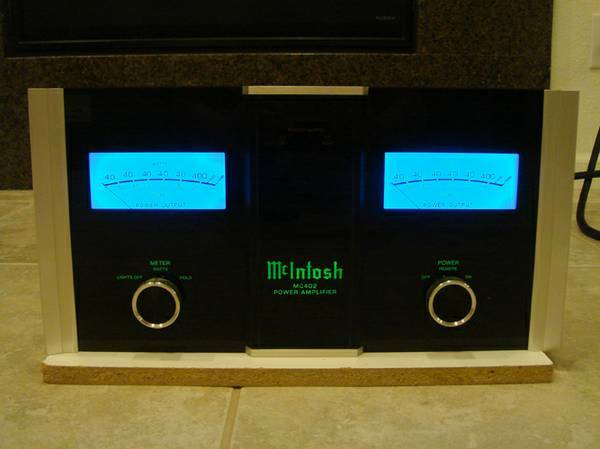 Its extraordinary quad-differential design consists of four complete amplifier circuits, whose outputs are combined in the unique McIntosh-crafted autoformers. The classic glass faceplate and the Fiber-Optic illuminated peak-responding meters adds elegance to any home theater installation. This was given The Absolute Sound Editor's Choice Award 2005.